Wireless notices detailing ships in communication with New Zealand radio stations were once posted daily on Post Office notice boards, with prices per word. It’s different today. The prices are higher and ships at sea are considered to be in communication. 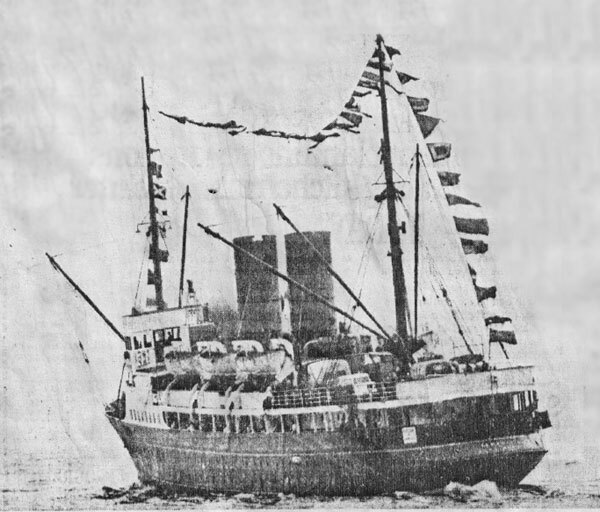 My first Union Steam Ship Company ship was the twopence-a-word Tamahine, making one trip a day across Cook Strait. I was the radio officer, dressed to a blue uniform from Keans the Naval Outfitters, white shirt, black tie, black shoes, I was the old sea-dog, or was I? My cap badge was unscratched, untarnished. Should I throw a bucket of salt water over my shiny sleeve braid and brass buttons of the USSCo logo? At one time the radio operator on Tamahine received less pay than on any other ship, presumably because he only worked four hours a day, except Friday when there was a double crossing back to Wellington for the weekend. I had work to do. In the mornings I topped up my batteries with distilled water, changed the carbon paper in my radio log book, dusted my ancient equipment. At sea, I received an occasional navigation warning and sometimes telegrams. I sometimes sent them too. Shortly after departure there was a decision to be made – what to have for the evening meal at 5pm. A white-jacketed steward brought me the typed evening menu for my consideration. Steak tonight? Saveloys? A cold collation? Baked beans? At 5 o’clock it arrived on a silver tray. The slide to the foyer and passengers was closed. The door was closed. The radio operator was dining. The other officers ate in the main dining saloon at 5pm, and while the passengers munched sandwiches and cakes and drank their tea, the officers ate steak, which produced envious stares and sometimes a bold passenger would ask to be served “what they were having,” to be rebuffed of course. Saturdays and Sundays she was a deserted, lonely ship; most of the crew had homes in Wellington. A return to the ship after the pubs closed at 6pm was sobering. She lay at her berth from 2am Saturday, after a double crossing, to 2pm Monday. I could imagine myself as captain in lonely command of a deserted ship, even if off to port were the skyscrapers of Wellington and the roar of traffic on Customhouse Quay. I was the only officer to eat aboard, with a steward to wait on me personally with silver teapots end coffee pots. Ah, dreams of grandeur. 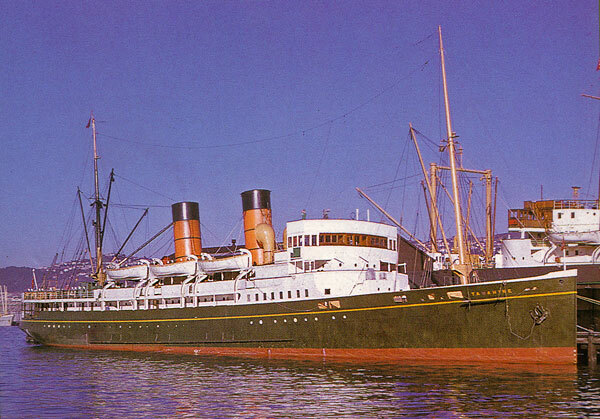 Built for the Union Steam Ship Company by Swan Hunter (UK) in 1925, Tamahine was old in the early 1950s. She was a ship from another age: dull wood panelling, layered paint, cracked varnish, the smell of fuel oil, paint and old socks, vomit, evaporated salt, weathered rope and canvas, rusted steel immured in her fabric. The radio room had its own smell of hot dusty valves, hot resistors, oozing oil-filled and wax capacitors, brass polish and sulphuric battery acid. 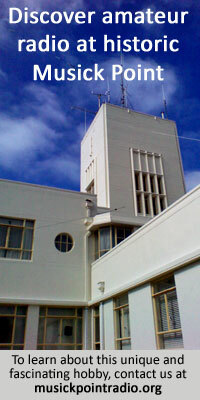 The Tamahine’s radio operator accommodation was next to the radio room on the promenade deck, at the head of the stairs from the main foyer. It had an old-fashioned oil lamp on the tongue and groove bulkhead lining and a handbasin which folded out of a wooden cabinet. The oil lamp wasn’t working in the 1950s, but it wasn’t so many years before that the ship’s own supply was shut down when alongside the wharf and she wasn’t connected to shore power by an umbilical cable. The handbasin had been connected to a waste pipe, but it was originally designed for a slop bucket in the base. 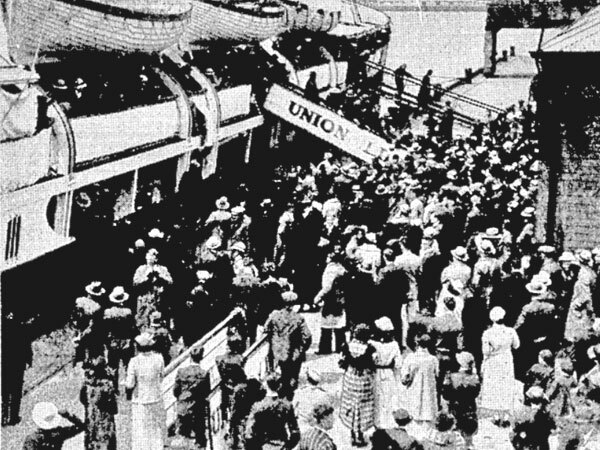 Passengers’ cars were loaded by sling and stowed in the hold or on deck. It was said that it could be arranged, if you saw the chief officer and not exactly bribed him, but for a consideration, your car could be loaded last – last on, first off. The chief officer also bought cheap farm eggs in Picton and sold them to office staff in Wellington. Tamahine was one of the few New Zealand ships fitted with radar, a 12-inch (30cm) Decca. The service manual was almost as big as the equipment and I read it bemused; radar was something I had only encountered in books. The ship was fitted with a Second World War model naval transmitter, but also the original ¼ kilowatt Marconi spark transmitter, and the smell of ozone as the sparks leaped in the silver-plated mica separated gap was something no valve or transistor transmitter can emulate. Despite that, I was Marconi himself: “Sparks,” the mad radio operator, dit happy, wearing a shirt with holes burned by battery acid and smelling of being washed with toilet soap and hung in front of an open porthole to dry. I was following in the footsteps of the radio operators of Titanic, ready at all times to send SOS when commanded by the captain. But where were the icebergs In Cook Strait? No matter, even if we just sank, I could be a hero, dragging my lifeboat radio to the number one boat and bringing rescuing ships to us by guiding them on my expertly sent Morse signals. No matter that I didn’t see foreign places, that girls turned up their noses at a radio operator on a ferryboat. “Do you clip the tickets?” a friend asked. I almost punched him. I had a deep-sea sailor’s gait as I rolled up Willis Street to collect my starched collars from the Chinese laundry. And if I looked down from the promenade deck and saw green cabbage leaves in dirty harbour water instead of green heaving deep sea, I still knew that I was somebody. The Safety of Life at Sea Regulations said that I had to be aboard for each voyage and the second mate always checked to see that I was aboard before we cast off from the wharf on another voyage into sea and spume and spray. And if one day in a screaming southerly I had been seasick in the radio room’s wastepaper basket as soon we rounded Point Halswell and still inside Wellington harbour, nobody knew, and even a new third mate had spewed over the bridge dodger upset by her violent motion. I had written to Marconi in England. They said they had jobs for wireless operators, but where was I going to get £90 for the sea passage on Rangitiki or Rangitata, or better still to travel first class on Dominion Monarch and maybe meet some sheep farmer’s daughter off on a grand tour, and detour her. I might do a pierhead jump if a radio operator went sick, or had an accident, and there was a chance of that, for New Zealand ports were crammed with ships and they all carried a wireless operator. My first class radiotelegraph operator’s ticket could take me any place in the world. 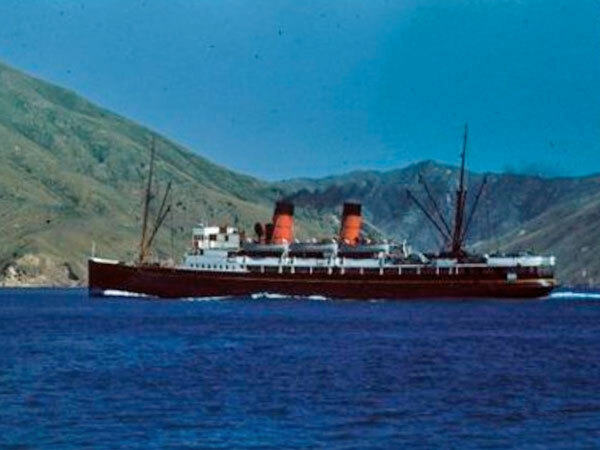 In August 1962, Tamahine made her 16,000th crossing of Cook Strait – her final trip before being replaced by Aramoana.